Good morning, here are your Sunday’s Patriots news 1-21, & AFC East Notes. Another week, another crazy news week as Tom Brady’s hand injury has dominated the talk all week. We know that he indeed injured his hand during practice this week during a collision with a running back. And thankfully the X-Rays were negative. But the amount of speculation on what exactly the injury is, especially by trying to diagnose it from a picture at practice while his hand was covered with a glove? Over the top. We’ll see how badly (or not) his hand is injured today just after 3 p.m. today. Gronkowski’s Postseason Numbers are Impressive: One other quick tidbit for today’s game. In his last six postseason games, Rob Gronkowski has totaled 37 catches for 512 yards and seven touchdowns. And the big man is healthy this year and anxious to play. It will be interesting to see how well the Jaguars cover him today and how they go about it. If they can cover him with single coverage, it will go a long way in being a great day for their defense. If they are forced to double him, it pulls coverage away from someone else. We’ll be looking for them to rotate different looks at him. In a league that is supposed to be obsessed with the idea of parity, the Patriots under Bill Belichick have thumbed their collective noses at that suggestion once again. Today will mark the Patriots seventh straight conference championship appearance another record and a feather in the cap for Belichick who remains without peer as an NFL coach. The amazing thing is he does it year after year and is never even one of the top names for coach of the year. Head shaking to say the least. The two coaches, vastly different in their approaches but exactly the same in the burning desire to learn all of the answers, aren’t the type to feel like they know everything. Instead, what makes them both so great is their continued desire to learn. When the Patriots signed James Harrison after he was released by the Steelers, many, too many believed it was simply a ploy to learn the Steelers playbook by Bill Belichick. It was a short-sighted take at best. Harrison has been a valuable contributor to the Patriots defense and in the regular season finale as well as the playoff game against the Titans, he’s played well while learning the New England defense on the fly. Harrison has played in over 45 percent of the defensive snaps and has been very good at setting the edge in the running game. With the big, physical Leonard Fournette in the backfield for the Jaguars, Harrison could see an added workload this week. With a Patriots victory this afternoon, Harrison could be suiting up for New England in the Super Bowl. That won’t play out well in Pittsburgh. 2: Number of field goals Stephen Gostkowski needs to become the #3 kicker in postseason field goals made behind Adam Vinatieri and David Akers. 2: Number of Special Teams tackles that Matthew Slater needs to become the Patriots all-time postseason leader. 5: Number of defensive tackles that Devin McCourty needs to pass both Rodney Harrison and Vince Wilfork to become the #4 leading tackler in team postseason history. 6: Number of Red Zone takeaways by the Patriots defense in 2017, most in the NFL. 7: Amount of catches needed by Rob Gronkowski to pass Dallas Clark and become the NFL’s All-Time leading TE in postseason receptions. 7: The amount of 13-win seasons by Bill Belichick, the most in NFL history. George Seifert is second with 4. 11: The number of times the Patriots scored in the final minute of the first half in 2017. 12: Today will mark the 12th conference championship that Tom Brady will play in. He already owns the record at 11. Gene Upshaw and George Blanda (10) are in 2nd. 12: The number of seasons the Patriots defense has held opponents to 20 points or less since 2001. In 2017, 18.5 points allowed per game, 5th in the NFL. 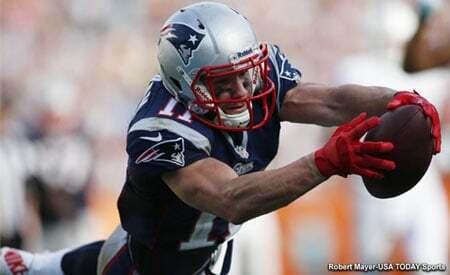 13: Number of yards receiving that Rob Gronkowski needs to become the all-time playoff leader at tight end. 13: With his 337 yard passing performance last week, Tom Brady has 13, 300-yard passing games in the playoffs, the most in NFL history. 18: Home playoff wins by Tom Brady with a home record of 18-3 in the postseason. 40: Number of 25+ yard passes by Tom Brady, most by a QB in the NFL in 2017. 53: Amount of 4th Quarter comebacks by Tom Brady with the score tied or behind. The Patriots did not activate WR Malcolm Mitchell off of IR and the Patriots talented second-year player will have lost the entire season due to injury. There was the slim hope that he could be activated during the playoffs and possibly contribute in the conference title game or the Super Bowl if the team moves on. Jonathan Jones, a key special teams performer as well as the team’s valuable nickel back contributor was injured in the Titans game and was also placed on season-ending IR this week. His place on the STs unit will be taken by Jonathan Bademosi. When one talks about the rookies who play in their first NFL season, the talk usually gets to the “Rookie Wall” in their first year in the league. The season is much longer than in college, then factor in preseason and playoffs and many times, the rookies, who’ve never played this long in a season, wear down. But the Patriots have been fortunate that two of their rookies Deatrich Wise and Adam Butler have continued to play well and be key role players in the team’s front seven thru the end of the regular season and into the playoffs which continue today. Wise, a 4th round draft pick from Arkansas impressed observers since the beginning of training camp. He carried himself like a seasoned pro and has had a solid 2017 rookie season with 5 sacks and 26 tackles playing in about half of the team’s defensive snaps. Butler was an undrafted rookie free agent from Vanderbilt who no one gave a shot at making the 53-man roster in training camp. So he ended up on the roster the old-fashioned way…he earned it. Butler played in just under half the defensive snaps and has grown into his role, improving from week-to-week. Both young players will have to continue to step if the Patriots are to win today and continue on to Minnesota. Divisional Weekend Last week 1-3 mark. The Buffalo Bills started their offseason off with a bang, signing former Alabama OC Brian Daboll to run the Bills offense in 2018. Daboll brings a loaded resume with him to Orchard Park and the Buffalo offense will definitely look different next season. Daboll has a National Championship in his only season on Nick Saban’s staff along with two Super Bowl wins as part of Bill Belichick’s crew in New England. Now Daboll and Head Coach Sean McDermott will have to decide what direction they’re going to go at the QB position. Will they stick with either Tyrod Taylor or Nathan Peterman or look to the Free Agents/NFL Draft to find their franchise QB. Most people believe Daboll would prefer a pure passer. This spring should be quite interesting for Bills fans. Oklahoma QB and Heisman trophy winner Baker Mayfield lit Twitter on fire with his comments on the social media page when he posted “#Get me to Miami” on his Instagram account this week. Social media, being what it is at times exploded with hot takes with Mayfield supposedly taking the track that he only wanted to play for Miami. The truth, is it so often is, was much more benign. Mayfield explained that he was just sending a message to former Oklahoma wide receiver standout and Dolphins wide receiver Kenny Stills. Mayfield’s post caused him to have to remark, “Just so everybody knows. … I commented about playing for Miami because I was talking to a former Sooner in Kenny Stills,” Mayfield said. Worse still was the fact that Anderson then threatened the police officer’s wife, stating allegedly “I’m going to f**k her and nut in her eye.” He’s facing nine charges and was arrested last spring at a music festival after refusing to sit on the ground and pushing a police officer. Anderson totaled 63 catches for 941 yards and 7 touchdowns during the 2017 regular season. 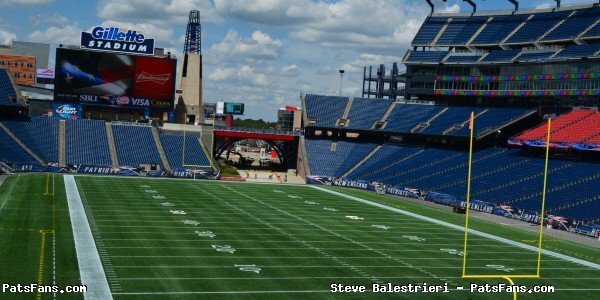 This entry was posted in 2017 Patriots Postseason, NFL Commentary, NFL News, Patriots Commentary, Patriots News and tagged Adam Butler, Bill Belichick, Chris Hogan, Danny Amendola, Deatrich Wise, Dion Lewis, James White, Malcolm Butler, Miami Dolphins, New England Patriots, New York Jets, NFL, Patriots, Patriots edge rushers, Rob Gronkowski, Stephon Gilmore, Tom Brady, Trey Flowers on January 21, 2018 by Steve Balestrieri.